How much is Jaren Johnston Worth? Florida Georgia Line Net Worth: Florida Georgia Line is an American country music duo who has a net worth of $50 million. 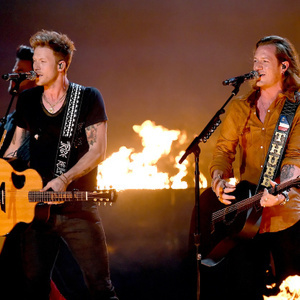 Florida Georgia Line consists of Tyler Hubbard and Brian Kelley. The pair met while attending Belmont University in Nashville, Tennessee. Florida George Line released their first EP Anything Like Me in 2010. They released their second EP It'z Just What We Do in 2012. The EP hit #1 on the U.S. Heatseekers chart. They released their debut studio album Here's to the Good Times in 2012. The hit single "Cruise" has been certified 8x Platinum in the United States. The album has sold almost seven million copies and hit #1 on the US Country chart, and #4 on the Billboard Hot 100. A popular remix of the song featured the rapper Nelly. The album also produced the hit singles "Get Your Shine On", "Round Here", and "Stay" which all hit #1 on the US Country Airplay and Canadian Country charts and were certified Platinum. The single "This is How We Roll" featuring Luke Bryan hit #1 on the US Country chart and also went Platinum. The group signed with Republic Nashville in 2012. The single "Dirt" from their upcoming album was released in 2014 at hit #1 on the US Country chart. Florida Georgia Line has won three Academy of Country Music Awards, four CMT music awards, two Country Music Association Awards, an American Music Award, and a Billboard Music Award.